The first week of the Giro d’Italia was simply brutal and the riders will be pleased to know that the second part of the race should be a bit easier. That is reflected in the first stage after the well-deserved rest day as the riders will be allowed to get back into the racing rhythm during an almost completely flat ride along the Adriatic coast where the sprinters will be looking to grab one of what should be two opportunities this week. The first week was a frustrating one for the sprinters who only had two chances during the first 9 days, and so they will be glad to know that the 6-stage second week offers them another two opportunities. The first comes on the day after the rest day which should also provide the GC riders a good opportunity to get back into the racing rhythm without any big dangers. The second week of the Giro usually starts with a long northerly run to the mountains in the north and often has a completely flat stage along the Adriatic coast. This year that stage comes on day 10 when the riders travel over 200km from Vicitanova Marche to Forli. The stage is entirely flat, and covers almost the whole of the Adriatica coastal road. The route unfolds along wide and largely straight roads for 100km, with just a brief detour to climb up Monte di Gabicce (category 4, 4.8km, 3.5%, max. 9%) from the Pesaro slope. The following 60km run straight along the ss. 9 Via Emilia, through Santarcangelo di Romagna, Cesena and Forlimpopoli, leading to the finish in Forlì. The last kilometres past Forlimpopoli run along straight roads, with roundabouts and traffic dividers being the main obstacles typically found in urban areas. Approx. 2 km before the finish, there is a 1,500-m setts paved sector, with a bend 1,100m from the finish (Piazza Saffi) and a bottleneck 800 m from the finish. The route features one last bend 500 m before the finish. The home straight is on level, 7-m wide asphalt road. This is the 9th time a stage has finished in Forli. It last happened in 2006 when Robbie McEwen beat Olaf Pollack in a bunch sprint, with the German taking over the leader’s jersey from his teammate Serhiy Honchar. The two most recent editions of the Giro d’Italia have been marred by cold and wet conditions but it seems that the 2015 race will be a completely different affair. After a hot, sunny first week, the riders will resume their racing on a summer-like day along the Adriatic coast. It will be beautiful sunshine all day and with a maximum temperature at the finish of 29 degrees, the heat will definitely be an important factor. Due to the warm conditions, it may actually be rather pleasant that there will be a moderate wind from a southwesterly direction. That means that the riders will have a crosswind from the left all day. At the start, it will be a cross-tailwind while it will gradually become more of a cross-headwind as they get closer to the finish. For the final 10km, the riders will turn into a tailwind which will make for a blisteringly fast finale. The day after a rest day is always feared by the riders as nobody knows how the body will react after their racing rhythm has been broken. Hence, they will all be pleased to know that the first stage after their rest will be the easiest of the first half of the race and even though it is a big day for the sprinters, it will be a relaxed and calm affair for most of the riders and for most of the time, it will be a less stressful day for the GC riders. In fact, it signals the start of a survival phase for the main contenders who have already battled each other a lot over the last few days. The second week is clearly the easiest of the race and even though it ends with two big GC days, most of it will be made up of stages for sprinters, puncheurs and attackers. It is no surprise that many riders have marked this part of the race out as the point to strike and the sprinters will be keen to grab two big opportunities during the next four days. The first of those chances comes tomorrow in what is almost a completely flat stage. It is hard to imagine that it can be any flatter than this long ride along the coast but Friday’s stage to Jesolo is actually even easier. Nonetheless, tomorrow’s stage should be a very calm affair. The Giro d’Italia only offers six sprint stages - 2 in each week – but several teams have still lined up teams that are fully focused on the fast finales. For Trek and Giant-Alpecin, those stages are the biggest goals and with Jurgen Van Den Broeck out of podium contention, Lotto Soudal will also be almost fully dedicated to these stages. IAM also have a very sprint-focused line-up so there is virtually no chance that stage 10 won’t come down to a bunch sprint. This means that we should be in for a very easy start to the stage and it will be a complete contrast to what we saw in stage 9. The break will probably be formed straight from the gun and will include riders from Androni, Nippo-Vini Fantini, CCC and maybe also Southeast. Tinkoff-Saxo will do the early pace-setting but very quickly the sprint teams will come to the fore. In the Tour de France, it has always been left to Etixx-QuickStep, Lotto Soudal and Giant-Alpecin to chase down the break but in this race the sprint hierarchy is more open. That was evident in stage 6 where it was string how a lot of sprint teams formed an alliance. Lotto Soudal, IAM, Trek, Lotto Soudal and Giant-Alpecin all put a rider on the front and later Lampre-Merida and even Sky took a few turns. With that kind of cooperation between the sprint teams, it will be a very controlled affair. There will be a crosswind all day but it is unlikely to make much damage. These coastal stages feature in the race every year and the wind has rarely been strong enough to create any kind of separation. It may create a few nervous moments, especially, in the finale but we would be surprised to see any kind of splits. After what is likely to be a stress-free ride in the sun, the final 30km will be very hectic and it will be a huge battle for position. The sprint teams will probably take a back seat while the GC teams take control but they will be ready to strike as we approach the final two turns. That’s probably where the race will be won or lost and may be even more important than the actual sprint. The Giro is known for its many tricky finishes and this one is definitely one of those. The first two sprint stages have been very unusual as they have had long, wide finishing straights but tomorrow it will be a different affair. With two turns in quick succession and a short, narrow finishing straight, it will be more about positioning, lead-out and acceleration than actual speed. This may change the hierarchy compared to the first few sprint stages. With a strong tailwind on the long straight road that leads to the final few turns, the pace will be immensely fast and it will make it easier for the lead-out trains to hit the front a bit earlier. Going into the first of the two turns, we can expect a real sprint between the best lead-out trains and if you are too far back at this point, the race will already be lost. André Greipel has clearly been the best sprinter in this race. This is of course no surprise and he will be keen to take a second win tomorrow. However, this technical finale doesn’t suit him very well and it will be much harder for him to come out on top. Instead, we will put the favourite tag on another sprinter. Sacha Modolo loves these kinds of technical finales as he is both very agile and has a good acceleration. However, his strongest weapon is his lead-out train. Already at the start of the race, we claimed that Lampre-Merida had the best team for the sprint finishes and they have fully lived up to our predictions. In fact they have hit the front at the right time in stages 2, 6 and 7 and have proved that they have the biggest amount of firepower for the fast finales. The train is made up of Roberto Ferrari, Maximiliano Richeze and Modolo and those three riders are all strong enough to win sprints. No other team can boast that kind of speed in these finales and this is a clear advantage for Modolo. In stage 2, he was in the perfect position until a near-crash caused by Giacomo Nizzolo ended his sprit. In stage 6 Richeze again gave him the perfect lead-out but he decided to move onto Greipel’s wheel which gave him a nice third place. In stage 7, Ferrari again put Richeze and Modolo into the perfect position and Richeze did a very strong lead-out. Unfortunately, Modolo ran out of legs in the uphill finale. We will be pretty surprised if Ferrari doesn’t lead Richeze and Modolo into the penultimate turn in the first positions and then Richeze is very likely to be the first rider in the finale turn. If he can keep his speed for just a few hundred metres on the finishing straight, Modolo will be dropped off in a perfect position and with a tailwind, he will be able to do a pretty long sprint. He has the right acceleration skills to get up to speed and even though he is not as fast as the likes of Greipel and Viviani, he is not too far off. 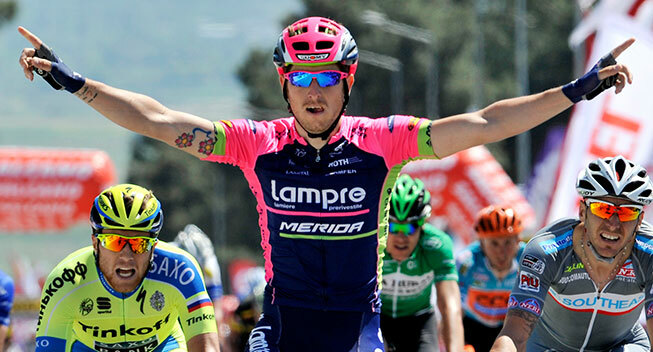 If Lampre-Merida can again nail the lead-out, Modolo will be hard to beat in this kind of finish. Of course André Greipel is also one of the biggest favourites. Going into the race, we were not too confident in his chances as he doesn’t have his best lead-out train here. In fact, only Adam Hansen and Greg Henderson are there from his usual train and only the latter has the speed to be there in the final kilometre. However, they really turned out to be surprisingly strong in stage 6 where they put Greipel in the perfect position and when that’s the case, no one is fast enough to beat him. However, the first two sprint stages have been perfect for Greipel and this one suits him a lot less. He is much better in a power sprint on a long finishing straight and we doubt that Lotto Soudal are strong enough to position him well. He is not very good at this kind of fight and tomorrow the battle will be very fierce. If he is too far back in the final turn, his race will be over. However, Henderson is really a great lead-out man and if he can keep the Kiwi’s wheel, Greipel may get through that turn in a position that will allow him to use his speed to win. When it comes to firepower in the lead-outs, Lampre-Merida are only rivaled by Trek who have an impressive line-up of fast finishers. Eugenio Alafaci, Fabio Felline, Fabio Silvestre, Marco Coledan and Boy van Poppel form a perfect train for Giacomo Nizzolo and on paper they are one of the strongest. Until now, they have been pretty disorganized though and Nizzolo has never managed to start his sprint from van Poppel’s wheel as the Dutchman has usually hit the front too early. Furthermore, he doesn’t seem to have the speed he had last year. On the other hand, the first two power sprints didn’t suit him very well. Tomorrow’s technical finale is really made for him and as he can rely on a great lead-out train, the stars may finally align for the fast Italian. Matteo Pelucchi got the race off to the worst possible start as he crashed hard in stage 2. Since then he has been suffering from an ankle injury and he has had some tough days in the mountains. However, he still had enough left to take a very impressive second place behind Greipel in stage 6 despite the fact that he had been dropped on the climbs at the midpoint. Tomorrow’s stage is a lot easier and he should be a lot fresher at the finish. That’s a big advantage for a pure sprinter like Pelucchi. On paper, he is one of the very fastest in this race and with the likes of Aleksejs Saramotins, Heinrich Haussler and final lead-out man Roger Kluge he has the firepower to bring him into the perfect position for this technical finale. Giant-Alpecin are famously known for their lead-outs but in this race they don’t have their strongest team at their disposal. Luka Mezgec can only rely on Bert de Backer and Nikias Arndt in the finales and so far they have not been working well together as they have lost each other in the first two sprints. On paper the trio is pretty strong but they will have to nail it to come out on top against the likes of Lampre-Merida and Trek in this kind of finale. Elia Viviani has already won a stage in this race and on paper he is one of the very fastest. However, he doesn’t have a real lead-out in this race where he only has Bernhard Eisel and Salvatore Puccio to support him. Those two riders also have to work a lot for Richie Porte and that will make it hard to put Viviani into a good position. Viviani is not very good at positioning himself and with lead-outs being very important in this kind of finale, it will be hard for the Italian to repeat his Genova feat even though he has the speed to win. Finally, we will select a few jokers. Manuel Belletti is one of two Southeast sprinters in this race and he shares sprinting duties with Alessandro Petacchi. Those two will decide who to protect but as the stage finishes close to Belletti’s home city, it should be a day for the former Androni rider. Belletti is clearly in very good condition as he has already been fourth twice and with Petacchi to lead him out, he has a very good chance of repeating that performance. Nicola Ruffoni doesn’t have a real lead-out which is a big disadvantage in this kind of stage. However, the young Italian is known for his risky approach to the sprint finishes and this is very important in this kind of technical finale. Last year he nearly beat Marcel Kittel and Mark Cavendish so there is no doubt that he has the speed to be up there. If he is in a good position in the final turn, he could find himself in the top 3. Davide Appollonio has had a hard start to the year as he broke his wrist in March. However, he managed to get into good condition for the Giro. In fact, he has been climbing very well in this race and seems to be close to his peak. Like Ruffoni he doesn’t have a lead-out but he is very good at positioning himself and this is important in this kind of stage. Nippo-Vini Fantini lost sprinter Daniele Colli due to the dramatic crash in stage 6 so now they will be looking to Eduard Grosu. The young Romanian is a talented sprinter and he has the skills to do well in this kind of finish. It may be a bit too early to mix it up with the very best but tomorrow will be a good chance for him to test himself at this level.